Two cow elk were shot and left to waste in Philips County during the last few days of Montana’s general hunting season. Montana Fish Wildlife and Parks recently issued the following news release. Montana Fish, Wildlife and Parks Region 6 game wardens and federal wildlife officers are seeking any information regarding two cow elk that were shot and left near the CMR’s Slippery Ann Elk Viewing Area, about 20 miles south of Zortman in southern Phillips Co., sometime on or around Nov. 23. 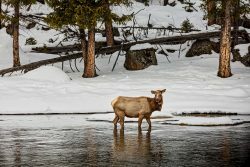 The two elk were found at the junction of CMR route 854 and 101, on the east side of the Slippery Ann Elk Viewing Area. A third elk was apparently shot, as there was a pile of entrails left behind. The elk were within 50 yards of each other and visible from the roadway. The two wasted elk were not salvageable due to the amount of time elapsed. Anyone with information about the crime is encouraged to call Malta-area warden Ben Morin at 406-654-7630, federal wildlife officer Deborah Goeb at 406-464-5181 ex. 13, or call FWP’s 24-hour wildlife tip line at 1-800-TIP-MONT (1-800-847-6668).